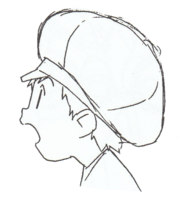 Himi Tomoki is one of the protagonists of Digimon Frontier. Himi Tomoki is a Chosen Child, chosen by Ofanimon to inherit the Legendary Spirits of Ice. He is the youngest of the group, and starts out as a bit of a crybaby. However, he is also kind-hearted, brave and modest, and quickly begins to mature through his experiences in the Digital World. He will not tolerate any bullying, which comes from his experiences of being bullied in the Real World. Tomoki was always spoiled by his parents, who gave in to his every whim and bought him all the toys and candy he desired. His much-older brother, Yutaka, disapproved of his parents' way of raising Tomoki. He refused to pamper Tomoki, telling his younger brother that he'll never learn how to do things by himself if he will rely on other people. Because of this, Tomoki resented Yutaka, and thought his brother did not love him. Tomoki was being bullied by Katsuharu and Teppei, two older boys from his school, when he received Ofanimon's call. The two bullies dragged him to Shibuya Station and pushed Tomoki onto one of the trains in the underground terminal against his will. On the train, he met Kanbara Takuya, Shibayama Junpei and Orimoto Izumi. 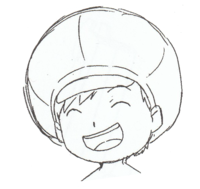 Though he wanted to go home at first and almost got himself killed trying to walk on the tracks back to the Real World, seeing Takuya evolve into Agnimon and saving him changed his mind. Because of this event, Tomoki became very fond of Takuya, thinking of him as a hero and a surrogate older brother. Soon, he too found the Human Spirit of Ice and evolved into Chakkumon. 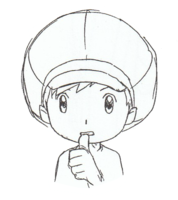 When a group of Toucanmon stole the children's D-Scans, it was Tomoki who found them at a Nanomon's pawn shop. However, Nanomon wanted Tomoki to trade something in for them, and Tomoki set off to find the Toucanmon, who traded the D-Scans in for an old camera. He found them in a frigid area, and when he tried to take the camera, the Toucanmon fell through the ice. He rescued the birds out of the goodness of his heart, but the ungrateful Toucanmon fled with the camera, intending to trade it back for the D-Scans. However, when Nanomon checked the camera, he saw the footage of Tomoki's kind act which was recorded on it, and was so impressed with Tomoki's honesty that he gave him the D-Scans. 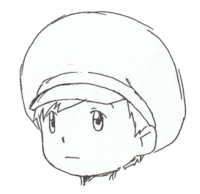 Additionally, he installed the Beast Spirit of Ice into Tomoki's D-Scan, which allowed him to evolve into Blizzarmon. 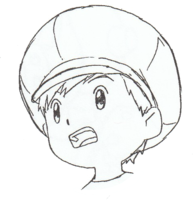 When Sephirothmon sucked the Chosen Children into his body, Tomoki eventually found himself alone in the Fire Sphere, where he was attached by a mysterious Digimon. After he escaped, he met a cloaked Digimon named Asuramon, who accompanied him in his search for the other Chosen Children. When Tomoki was tired and thirsty, Asuramon declared his friendship and volunteered to get water for him, which reminded Tomoki of how his pampered behavior angered his brother Yutaka. In the end, it became clear that Asuramon was after Tomoki's Spirits, and he revealed himself to be the same Digimon that attacked Tomoki earlier. When Asuramon mocked Tomoki for not having friends, Tomoki realized what Yutaka meant when he said he should be more self-reliant. After purifying Asuramon's data, he vowed to tell his brother that he loves him as soon as he returns from the Digital World. When they were fighting the Royal Knights, the Chosen Children met four other children who came to the Digital World with the Trailmon. Though they weren't chosen to inherit any Legendary Spirit, these children decided to stay in the Digital World and explore it, and were guarded by an Angemon sent by Ofanimon. 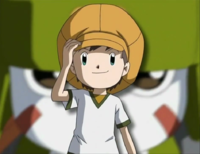 Two of the children were Katsuharu and Teppei, who bullied Tomoki before. Though they tried to bully him some more, he wouldn't stand for it, having grown more self-reliant and confident with time. He ended up saving their lives twice, and they began to respect and like him. 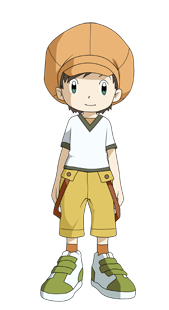 Tomoki appears in the form of Chakkumon to supply Takuya with the spirits to evolve him into Susanomon. 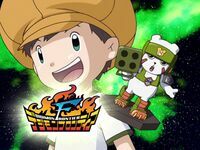 Movie: Revival of the Ancient Digimon! !